When I began this blog back in 2004, no one outside of Denmark really used the word ‘hygge’ and there definitely wasn’t blogs, articles, books and twitter handles dedicated to it. And my memory might not serve me well but I don’t think there were a lot of images being used to show it either. I think that was part because hygge really is a feeling and not a thing. Danes know this, people who want to sell it do not. Now, it seems like every magazine or blog post has something to do with hygge. I’ve seen “top 10 hygge food” lists, hygge hair, how to buy a hygge living room and so on. The images are always the same – overly styled, sort of hipster, fluffy this, cup of coffee. That highly styled, store-bought image? That’s not hygge. What hygge really looks like is in the image above. 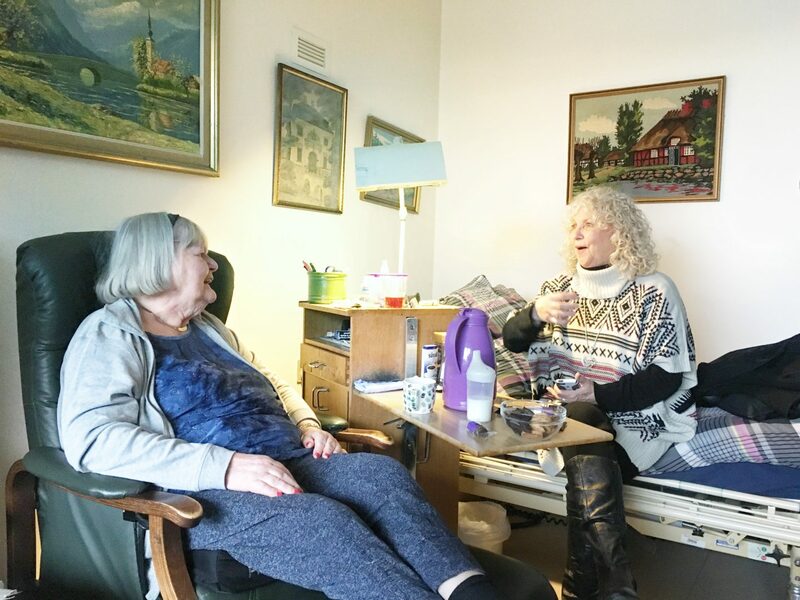 It’s my mother on the right with my great aunt who lives in a care facility just outside of Copenhagen. Her little room isn’t fancy, styled, or magazine worthy. When we visited, we had the traditional Danish visit with coffee and a little sweet. Coffee was just the cheap kind from the home, housed in a plastic purple carafe and we had it in paper cups and the sweets weren’t home made but individually wrapped in plastic from a shop. The room wasn’t prepped before we came so things were here and there but the basic tea light candles were lit of course, little plants were in the window and art collected over the years was all around. There was no designer furniture (you can see my mum sitting on a hospital bed) or dozens of pillows plumped up against perfectly white walls. It was a functional room with a few personal items that reflected my great aunt and made it feel like her home. My two second cousins were also in this tiny room and for a few hours we snakke snakke snakke (chatted) and as we did, nurses and fellow residents came in and out. And each time someone came in, saw us all huddled around, drinking coffee and laughing, they would say “Det er så hyggeligt” (this is so cosy). Hygge must have been said a dozen times over the course of the visit. No one wished they were somewhere else, no one wished they had something more than what was there. In those moments there was no worry, just joy. And that’s what real hygge is – a simple moment that feels so special, cosy, relaxing, loving or happy that you just need to call it out. It’s not about being fancy, or styled, or being in the best circumstances, or having the right things. It’s literally about being present enough to see how great a moment is, and give that moment a name – hygge. I share this because I don’t like seeing comments from people who are looking for some kind of life fix and literally buy into a concept when they don’t need to. That is so the opposite of what hygge is and how Danes live. Thinking that hygge looks a certain way or can be gained by following 10 steps or buying 3 key items sets a person up for failure, I think. Like if they don’t do x,y and z they aren’t living the right “hygge” life. But Hygge is a little bit like Dorothy’s ruby slippers – you already have the ability to live well. You just need to take a moment to recognise it. That’s all. So if you ever need a reminder that hygge is really simple and can be found in any circumstance, just look at this photo. It’s not the best photo ever, it’s not the prettiest, these are not people who have it all, but they’re people who were enjoying each other and the moment so much, that everyone could name it. And they called it, hygge. thank you for writing this! It’s easy to slip into thinking if you just have this that or the other your life will be perfect. When in reality your one sentence sums it up perfectly “Hygge in its simplest form is really about being present.” Just try to live an intentional life. Stay present. Tomorrow isn’t promised. Exactly: living in the moment. Difficult to remember sometimes! Wonderful post. As someone who has recently learnt about the word “Hygge” since it’s pretty much everywhere at the moment, this is refreshing to read. It seems whenever something new is found they always find a way to box and sell it to the masses. But this type of thing can’t be sold. Me too! But until this article I wasn’t able to clearly define it. Yes, this is what I initially thought “hygge” meant when I came across it. But then, a quick internet search brought up all that hipster stuff and I was a little disappointed. I am so glad to see this and realize that yes, I did get it… it is what I thought! And like so many things, it’s now being commercialized into something to sell, rather than really understood! Thank you!! Alex, I just love this! I saw the two women and the pleasant decor and never saw the hospital bed until you brought it up. I love that people came and went and enjoyed being there. that is hygge as I’m beginning to understand it! I have had many similar hyggelige moments over the years. Thanks for making it clearer. Thanks for reminding us to live in the moment. Absolutely. But this is the United States, the land of opportunity and commerce. It isn’t surprising that a philosophy of life, a certain way of living would absolutely be “hijacked” and turned into something saleable, marketable. Sad but true. Exactly!!! Thank you for writing this piece about hygge. I, as a Dutch Denmark lover, am not into the styled up version. Hygge can be felt with the heart, not bought or prepped. It’s all in the connection between people. I also wrote a small piece about it. Hygge is in you and in the moment. Wishing you lots of hygge stunder med snak og søde mennesker. Love this piece very much. Thank you for showing us an understanding of true hygge and that it is rooted in being in the present moment! Ugh, leave it to western culture (or totally lack thereof) to take something so simple and commercialize it until it spins out of control, and completely mucks up and distorts the truth. Everything you said…spot on. I’m not even a Dane, but I appreciate being PRESENT! My motto has been “present over perfect” (after reading a book of the same title), and it’s so refreshing and liberating to be just that. I have experienced lovely hygge moments and I look forward to more as they naturally unfold. Thank you for the reminder, as we are completely bombarded with the “rules of hygge”, that it is in fact not that; not a lifestyle. As soon as there are rules to something, it almost becomes a game of sorts – like who can “win” or who can do it the best. RUBBISH! This is such a beautiful and realistic article! I’m so happy you wrote it. As a non-Dane, I first thought, “Ooh, if I buy nice candles and play music and read and have x, y, z, I can be happy.” And you’re 1000% right. Last night was a perfect hygge night and I was wearing ratty PJs making dinner and my dad was relaxing in his recliner and our house was messy from our animals, but when my mom came home and we all sat and ate dinner I was filled with the most pure joy as if no moment could be better. I’d like to think this is hygge. This is fantastic and I’m totally guilty of ‘stylizing’ my comfort, so even though I’ll continue to do style photos, it’s nice to see the separation between what’s staged and what’s plain real life moments. hygge-not sure how to pronounce it, but I say huggies….It sounds like it’s warm memories. Simple and perhaps unplanned. I loved this post. It is heartfelt and pure. And it reminds me that buying coziness and well-being and comfort isn’t possible if you’re brain is cluttered with ill-will, regrets, anger and so on. So beautifully said. Each phrase is repeatable. Thank you for sharing this personal glimpse into what is a precious gift from another culture. I have enjoyed your photos, imagery, comments and resources to help create that “hygge” comfort in my home. Not changing much thus far, yet explaining to one son, some of the items out are what warms my heart, not what Western philosophy, magazines & television portray. I hope to utilize more personal items & restore or transform them into usable, items that reflect meaning and warmth in my heart, home, friends & family. It can be turning a meaningful photo into a breathtaking memory, with deep sensory perception of loved ones. Buying a photo to hang, is not nearly as meaningful as creating a collage or corner with charm & personal connections. Second hand items I picked up years ago, still bring joy to me and can be transformed into that warm “hygge” atmosphere. Creativity can rekindle and refine lost & forgotten treasures! Thank you for all you share, and may you always be encouraged to do so and blessed by the beauty of the gifts you share from your heart.Wishing you and all your readers an awesome “hygge” journey in 2018! “Hygge” reminds me so much of my Life of 30 years in the French West Indies.I had many Parisian Friends and one-Veronique whom I’ll never forget always said to me “You have to make your own private garden”.I think that saying is kind of like “Hygge” because it’s a concept,a feeling/life experience.I found a link about your Blog via Traders Point Creamery (whom I’m working with) and I could not but help but engrossing myself into “Hygge”.How delightful! I had wanted to locate to Topanga Canyon as a young 20 year old but circumstances changed and I ended up in the West Indies fulfilling many dreams I had about sailing.I love your style-I love your new place and that white desk-I know I have seen that somewhere and I’d wanted it but no more room right now although it is pretty and practical.I love everything about the new house-where do I start? Lavender, Rosemary,Meyer Lemon trees,that custom wallpaper that reminds me of Dalla Horses.Your Back Garden reminds me so much of Provence-in so much as the builder used locally sourced material and also the rock that became part of the front room which flows with the home.I’d never heard of a Wedgewood Cooker but it certainly is a stout looking one! I have a Design and Sign Firm in the West Indies,love designing,doing logos,ad-campaigns.No wonder I found “Hygge House” so interesting. We were in Copenhagen several years ago and stayed in a very hygge bed and breakfast. We had a great time and found the Danish people to b3 very welcoming to foreigners. Looking forward to going back! I just want to say thank you for this great commentary! Wonderful! Finally, a word for those best moments in life! I have valued hygge when it happened but oddly never had a word to describe it or thought much about trying to attain or facilitate that state of being. Hygge always seemed too perfect to create intentionally. Being present, not dwelling on the past or the future, and just appreciating and rejoicing in the moment is undervalued in this world. I am now trying to create the atmosphere in my home where hygge can be more frequently and readily achieved It is certainly not something that can’t be forced or obtained since it flows out of a person at least as much as it comes in. I do believe though that environment plays a vital role in removing barriers to hygge and by providing comforts that help ease the transition into hygge moments. It is a fascinating subject to ponder and attaining a more hygge friendly atmosphere is a very worthwhile pursuit. I plan to enjoy the journey and the many (and hopefully increasingly frequent) hygge moments along the way. I love this — the first thing I noticed was the institutional bed and thought…hmmm. This is real life! I’m linking to this post in my blog, so you might find some followbacks. You are a gifted writer. How beautifully you describe hygge. What a beautiful feeling and awareness of that feeling in special moments. A reminder that there is so much to be thankful for and how many moments in each day are we aware of these? Thankful to teaching me a new word(week, more than a word). I just Googled “hygge” to make sure I was spelling it correctly and came across your website. It’s lovely and I appreciate the way you’ve defined what hygge means! I am hosting a little candle exchange in my home for mom friends and wanted to make sure I’m capturing the word correctly, and I love that you said it’s a feeling. Helps me focus on the good company of our little gathering, and not just the fact that we’re going to purchase and exchange candles. Thanks for a beautiful definition of hygge. I have a friend who to me embodies this feeling – she lives so purposefully and I always feel this type of feeling around her. I want to give her a book about it but I don’t want to pick the wrong one and have it be that wrong focus you talk about above. Do you have any suggestions? I googled “hygge definition” and am so glad this is the article I read. I just learned a word for my soul.